We examine the floor to identify any areas that have evidence of water damage or loss of polyurethane finish as well as looking for any wax, oily residue or contaminants which would prevent proper adhesion of the new finish. 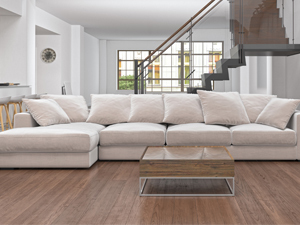 We clear the floor of all furniture to be removed and protect surrounding transitions. We remove loose dust and soil to provide optimal results. We use a special machine to apply solutions which release the deep soils and contaminants, creates mild agitation and extracts the solutions with the contaminants from the floor. No dust and safe for your floors. Cleaning is important, however some floors need an extra application of a refinisher applied to extend the life of the protection. After the floors have been prepped and cleaned, a refinisher of choice may be applied. This will require extra drying time compared to the standard cleaning. For a FREE evaluation of your wood floors or to schedule services for wood floor cleaning and refinishing, contact us online or call (936) 856-8610 today. We service Conroe, Cypress, Houston, Kingwood, Montgomery, New Waverly, Oak Ridge, Panorama Village, Shenandoah, Spring, The Woodlands, Tomball, and Willis.